Extending his original predictions for metallic hydrogen, Cornell's Neil Ashcroft later proposed that hydrogen-rich materials containing main group elements might exhibit superconductivity at accessible pressures. The hydrogen in these structures, he argued, may be considered “chemically precompressed.” These proposals, which were based on the Bardeen–Cooper–Schrieffer theory of a phonon-mediated mechanism for superconductivity, have motivated many theoretical and experimental efforts in the search for high-temperature superconductivity in hydrides at elevated pressures. Within EFree, the Novel Electron Transport in Light Element Materials project has as one of its research directions the investigation of high-pressure crystal structures of potentially superconducting metal hydrides using theoretical modeling. To date, the simple hydrides with the highest predicted superconducting transition temperatures (Tc) are MgH6 (271 K at 300 GPa), CaH6 (235 K at 150 GPa), and YH6 (264 K at 120 GPa). Recent work from the EFree groups at Carnegie and Cornell has resulted in the prediction of two new, potentially superconducting hydrides of lanthanum and yttrium with remarkably high Tc at attainable pressures. 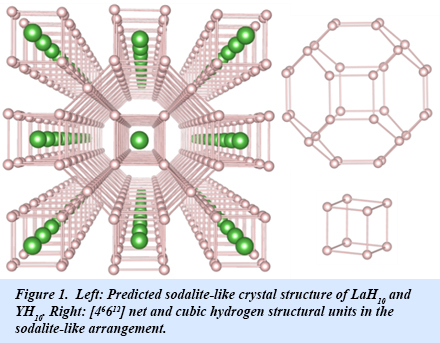 Both LaH10 and YH10 are predicted to adopt a sodalite-like structure (Fig. 1) at high pressures. Based on electron-phonon coupling calculations, the superconducting transition temperatures for these phases should approach or exceed room temperature. For LaH10, the predicted Tc is 274-286 K at 210 GPa, and for YH10, the predicted Tc is 305-326 K at 250 GPa. Moreover, the calculations indicate that these materials could be synthesized at pressures that are currently accessible in the laboratory. The results open the prospect for the design, synthesis, and recovery of new high temperature superconductors with potential practical applications [H. Liu et al., Proc. Natl. Acad. Sci. USA 114, 6690-6695 (2017)].